NuCell®IM provides the body with the natural nucleotide building blocks that are essential for the creation of these cells. DNA and RNA which occur in all cells are made up of molecules called nucleotides. Over a billion nucleotides are required to build one human DNA helix. DNA and RNA are formed every time a new cell is created. Nutri-tide™, the unique nucleotide nutritional formula in NuCell®IM provides your body with support for its daily nucleotide requirement. NuCell®IM contains: Nucleotides (Mutri-tide™ nucleotide nutritional formula), vitamins C, E and B vitamins and other nutrients. 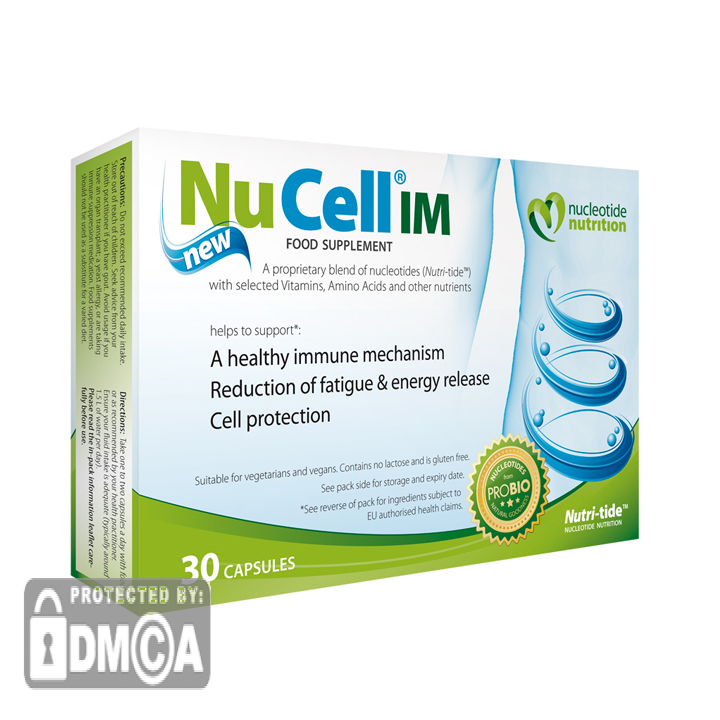 NuCell®IM is suitable for vegetarians and is gluten free. ClinicallyTested: Extensive testing shows that beneficial effects can be observed within a few days. The NuCell®IM ‘Nutritional & Lifestyle Challenge’ – helping users to better achieve a healthy immune system and improved energy and vitality now and long-term. *%NRV = Percent Nutrient Reference Value not established. Seek advise from your practitioner if you have gout. Avoid usage if you have had an organ transplant, have a yeast allergy, or are taking immune suppression medication. Food supplements should not be used as a substitute for a varied diet. L-methionine, Concentrated Extracts of RNA Nucleotides (from Saccharomyces cerevisae), Saccharomyces cerevisae, Inositol, L- Lysine, L-Ascorbic acid, D L-alpha tocopherol, Calcium d-pantothenate, Sodium citrate, Magnesium stearate, Silicic acid, Pteroylmonoglutamic (Folic) acid, D-Biotin, Cyanocobalamin. Capsule shell (vegetarian): hydroxypropyl methyl cellulose.